Come and Join ToucanLearn Now! Daily Diary for each child which can be shared with parents! Sticker charts, certificates, number, letter and color practice! Sign up FREE and start TODAY! You can join ToucanLearn FREE and enjoy lots of fun preschool activities, follow the Early Years Foundation Stage (EYFS), enjoy baby learning games and toddler craft, but for only £18.50 a year, you can get much, much more! Fay, Bedfordshire: I think ToucanLearn is FAB! It has really helped with my work and my parents love reading what the children have been doing and can share with the child’s dad and siblings. Fiona, Stirling: ToucanLearn is ideal for me as a childminder. It saves me so much time and the children have so much fun doing the activities. Andrea, Lincs: Your site looks great. I will be doing many of your activities with my kids. My little boy is especially interested in your maths type activities. Beverly, North Yorkshire: ToucanLearn is fabulous for any Childcare Practitioners who are delivering the Early Years Foundation Stage (EYFS) and has given me lots of ideas for activities. It's ideal for sharing children's progress with parents. Join ToucanLearn FREE - sign up immediately! Share each child's Daily Diary with parents, grandparents, childminders, carers or nannies! 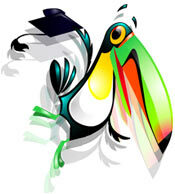 Tikal the Toucan is ToucanLearn's mascot! Follow Tikal's blog to read tips and insightful information about parenting, child learning, child development, the Early Years Foundation Stage (EYFS), games, craft, activities and everything else relating to preschool children!